What are the most popular names of the Ambo people in Namibia? Why do so many Ambos have Finnish first names? What do the African names of these people mean? Why is the namesake so important in Ambo culture? How did the long independence struggle affect personal naming, and what are the latest name-giving trends in Namibia? 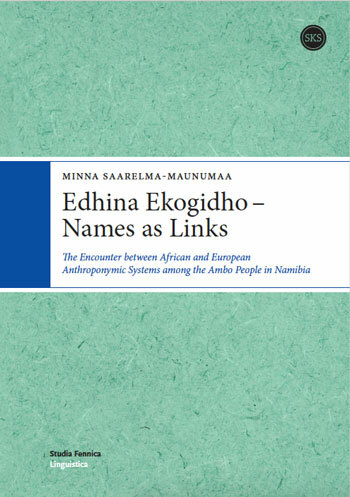 This study analyses the changes in the personal naming system of the Ambo people in Namibia over the last 120 years, starting from the year 1883 when the first Ambos received biblical and European names at baptism. The central factors in this process were the German and South African colonisation and European missionary work on the one hand, and the rise of African nationalism on the other hand. Eventually, this clash between African and European naming practices led to a new and dynamic naming system which includes elements of both African and European origin. Dr. Minna Saarelma-Maunumaa is the Publishing Director of the Finnish Evangelical Lutheran Mission and the Vice-President of the Finnish-Namibian Society.